Orion edo Ehiztaria neguan ikus daitekeen konstelazio handia da. Greziar mitologiako ehiztaritik datorkio izena; inguruan Eridanus (ibaia), bere bi ehiza txakur Canis Major eta Canis Minor, Taurus-en (Zezena) aurka borrokan irudikatzen da zeruan. Lepus (Erbia) ehizatzen ere. Orion konstelazioak izar oso distiratsuak dituenez antzinako zibilizazioetan konstelazio ezaguna zen, Betelgeuse (izar gorri handia), Rigel, Bellatrix, Alnitak eta Saiph. Esne bidean kokaturik, ortzi sakoneko objektu asko ditu, besteak beste Zaldiburu nebulosa, Oriongo nebulosa handia M42, Sugar nebulosa edo Barnard begizta. Orion's current name derives from Greek mythology, in which Orion was a gigantic strong hunter of ancient times. The constellation is one of the most recognizable winter constellation located on the celestial equator and visible throughtout the world. The hunter in Greek mythology, arround the hunter Eridanus (River), two dogs Canis Major and Canis Minor faighting with Taurus. Its brigthest stars are Rigel (a blue-white star) and Betelgeuse (red supergiant). 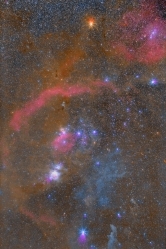 Orion has many deep-sky objets, amound of them the Horsehead nebula, Orion nebula (M42), Flame nebula and Barnard's Loop. Hauts fluxus osatutako nebulosak, gure galaxian dauden altitude handiko nebulosak dira. Hauts partikulez, hidrogenoz eta karbono oxidoz osaturik daude bere gehiengoan eta gure galaxiako izarrek argiztatzen dituzte. Irudian Herensugea konstelazioan kokatzen den Aingeru nebulosa ikus daiteke. 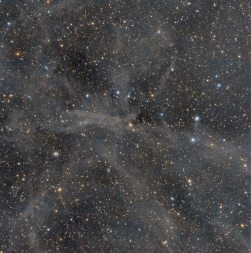 Integrated Flux Nebula are high latitude galactic nebulae in the Milky Way composed mainly of dust particles, hydrogen and carbon monoxide and are illuminated by stars in the Milky Way. Imaged here is the Angel nebula which is located in Draco constellation. Bellatrix izarretik 2 gradu iparraldera Masusta Nebulosa (LDN1588) aurkitzen da. Izarrak sortzen ari diren Lambda Orionis eremuaren zati bat da, eskuin aldeko islada nebulosa urdina VdB38 eta ezkerreko nebulosa igorle gorria Sh2-263ak osatzen dute Masusta nebulosa. Irudian eskuin aldean LDN1590 nebulosa marroia kokatzen da eta argazkian goian ezker aldean Lambda Orionis izarraren inguruan dagoen Sh2-264 nebulosa gorri handiaren zatia ikus daiteke. At 2 degree of Bellatrix The Raspberry nebula (LDN 1588) lies 1300 light years from us. Located in Orion constellation is part of the Lambda Orionis Star Forming Region. 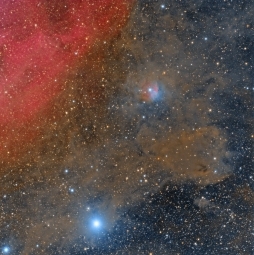 Its blue reflection nebula in the right is VdB38 and in the left red emision nebula is Sh2-265. At upper left in the field shows a section of the Lambda Orionis ring Sh2-264. To the right is LDN1590 (Sh2-265). Ilbetea koloretan: Ilargiaren kolore ezberdinak burdin eta titaniozko eduki nahasketaren bidez ematen dira. Ilargi-itsasoek, Ilargian dauden lautada edo ordoki basaltikoek islapena baxuagoa dute bertan dagoen burdin oxidoaren (FeO) kopuru handi samarragatik. Ordoki basaltiko batzuk berriz, burdin oxidoaz gain (FeO), titanio oxido (TiO2) kopuru handiagoa dute islapena are txikiagoa bihurtuz eta Titanio Oxidoak ordokien kolorea gorri-morroitik urdinera aldaratuz. 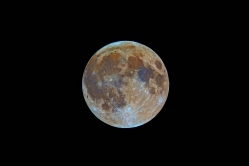 Colorful Moon: Colors on the Moon are given by variations in mixing iron and titanium content. 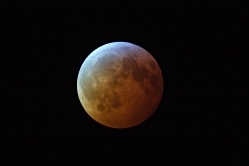 The mare regions have low reflectance because they contain relatively high amounts of iron oxide (FeO). Some mare basalts contain unusually high amounts of titanium oxide (TiO2) in addition to iron oxide, making lower reflectance and the TiO2 shifts the color of the mare from brown to blue. Sugardun Izar Nebulosa (IC405) gugandik 1500 argi-urtera kokatzen da eta 5 argi-urte zabal ditu, igorle eta islada nebulosa da Auriga konstelazioan aldizka distira aldatzen duen AE izar urdinaren inguruan. 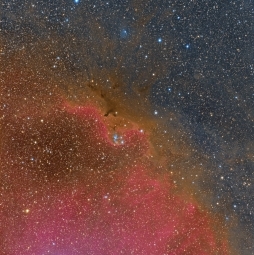 Ezkerrean IC410 nebulosa agertzen da baina hurrunago eta handiagoa da, gugandik 12.000 argi-urtera eta 100 argi-urte zabal. Irudian IC417 nebulosa-konplexu, NGC1907 eta M38 izar multzoak ere ikus daitzeke. Flaming Star Nebula (IC405) lies about 1.500 light-years and has 5 light-years across, is an emission and reflection nebula in the constellation Auriga surrounding the bluish irregular variable star AE Aurigae. 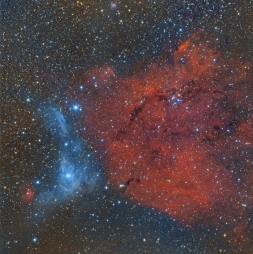 IC410 (left) appears at right but is in fact 12.000 light-years away and much larger 100 light-years across. 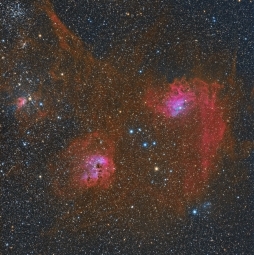 IC417 nebula, NGC1907 and M38 star cluster can be also seen in this wide field image. IC405 eta IC410 nebulosen eremua Ha iragazkiaz egindako irudian. 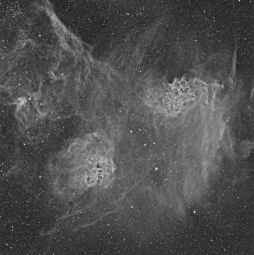 Image of IC405 and IC410 nebulae region taken through the Ha filter. 46P/Wirtanen kometak 5.44 urteko orbita periodoa du eta 1.2km-ko diametroa. Azkenekoz 2013an gerturatu zen baina gugandik urruti pasatuz 14.7ko magnitudea lortu zuen, 2018an gugandik gertu pasatuko da (11.6 milioi kilometrora) eta begi hutsez ikusten da zeru ilunetatik. 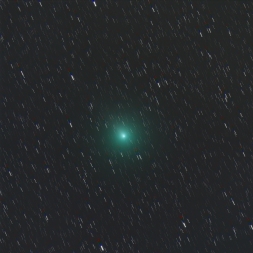 46P/Wirtanen has orbital period of 5.44 years and estimated diameter of 1.2 kilometers. 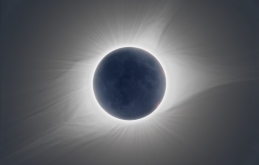 The 2013 perihelion passage was not favorable reaching a magnitude of 14.7. On 16 December 2018 Wirtanen will pass 11.6 million kilometers from Earth and is visible to the naked eye from dark skies.